If you can, soak quinoa over night before using ~ or rinse really, really well if that isn't an option (this rinses off the saponin coating that inhibits digestion). Bring quinoa and one and a half cups of water to a boil, reduce heat and simmer for 7-10 minutes until all water is absorbed. When the quinoa is cooled, toss in the remaining delicious ingredients. Great with to eat in big scoop fulls on corn chips. Great to travel with for a quick meal or picnic. Great to make in large batches if you are stuck for a potluck! Quinoa has become a favorite food in our home ~ Quinoa is gluten free and easy to digest. It is high in protein, containing all 9 essential amino acids, classified as a complete protein. It is rich in enzymes, iron, vitamins, minerals, and antioxidants. It tastes wonderful, with a nutty earthy flavor. No wonder Quinoa grain was once called "The gold of the Incas" and "The mother of all grains"! The other day we awoke to the ground being covered in a blanket of snow. Yes, that's what we get for putting our winter coats and boots away. 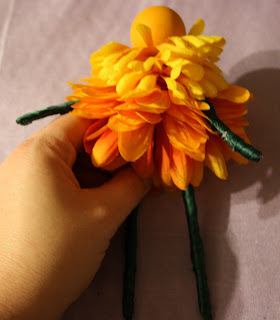 In the spirit of hopefulness though, we made some flower fairies, to bring the spring inside! First things first...you must cut your dowel into short pieces for the fairy body...about an inch and a bit will do. Your dowel should fit into the hole in your bead comfortably, (I use a 3/4" bead with a hole). You can paint your bead if you wish, cover it with beeswax polish, roll it in glitter, or keep it plain...it's up to you! 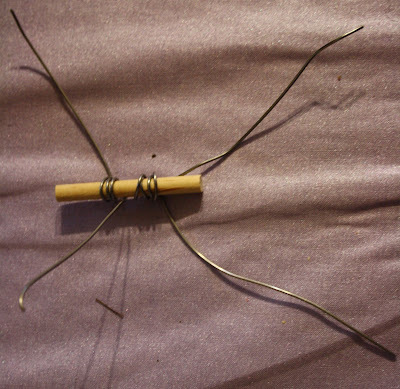 Next cut your lengths of wire...I use a 12 inch piece for the legs and a 9 inch piece for the arms...take your wire and wrap it around your dowel a few times, until they are a desirable length. Slide the wire off of the dowel, get your ribbon and fire up the glue gun. 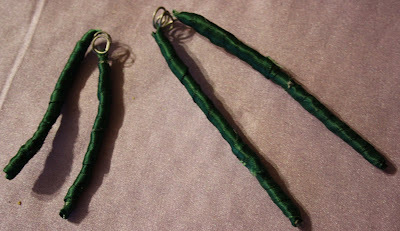 Starting at the top part of the arm, put on some glue and then begin wrapping your ribbon overtop...continue to the bottom of the wire, (the hand), and rewrap back up to the top, then do it again. 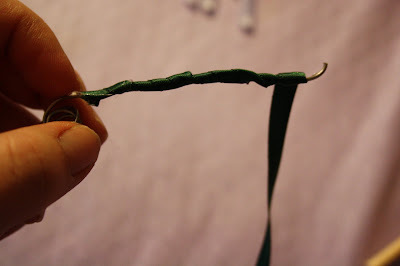 Basically, you are just putting on a small line of glue, then wrapping the ribbon, then glueing, wrapping... When you're satisfied with the thickness, cut the ribbon and glue the end down. Do the same on the other side and with the legs as well. Now, take your legs and put them at the bottom of the dowel. Take a bit of glue and glue them in place. Get your flowers ready, take them apart and give the centers of them a little nick with the scissors, (to make the holes a little bigger for sliding onto the dowel). 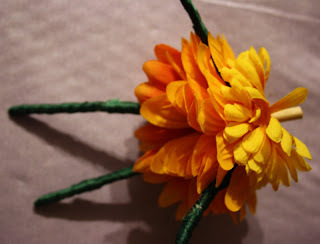 I usually glue the first petal around the bottom, to hide the top of the leg wire. 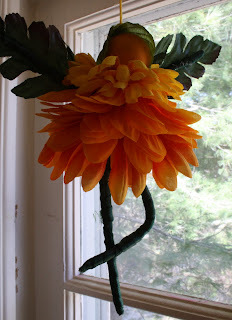 Keep adding flowers until you are satisfied with the body, (the trick is to use the big petals for this part). Slide on the arms...it helps to add a bit of glue here, to hold the arms in place, and add more petals, (now you want to go for the smaller petals), until you begin reaching the top of your dowel. It's time to put on your head bead, glue it into place. You're almost done now...you can leave the head bare, or put a petal on top, or a couple of leaves. When you're happy with your fairy, screw the eyehook into the top of the head and she is ready to hang...the beauty of using wire for the arms and legs is that you can pose her any way you wish! *I also like to add a few bigger leaves onto the back of the arms, to make "wings". There you go...now you have some lovely fairies to adorn your windowsill, ceilings or where have you! My one word of advice for crafters is, don't make it too complicated...have fun with it, play around with the rules and enjoy the process! Happy crafting to you all! Please feel free to make as many fairies as you please, give them to your friends, or start your own flower fairy business, (I used to make these by the 100's and sell them at craft fairs)...in my mind, the more fairies out there brightening up folks spaces, the better! With spring now upon us and the green shoots peeking their heads up all around us, I am green inspired. I thought I would share my favorite way to get fresh greens into my kids. 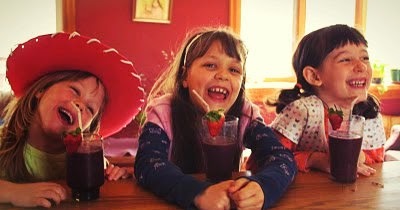 I know, it sounds suspiciously like a new food that your kids would say ewwww to, yet when given a purple hue and served with a confident smile... they drink it down with a MMMmmm! This is my basic recipe that we all love, but there are so many different ways you can jazz it up or change its style. Place your spinach into the blender, add your berries and bananas and then pour your juice and milk until you reach the top of the fruit in the blender. Other options we love adding ~ plain yogurt ~ coconut milk ~ hemp protein powder ~ flax oil ~ almond milk ~ hemp nut... so many options! It is wonderful if you can find most of these ingredients in the organic form (especially the spinach). Green smoothies are a nutritional powerhouse, brimming with valuable nutrients. They are easy for the body to assimilate, full of fiber, rich in chlorophyll and high in antioxidants, a brilliant blend for our growing children. I also must add that as a mama, they have offered me more ENERGY ~ a gift we all welcome! The kids can help with the whole creation and nibble on some yummy frozen fruit in the process. 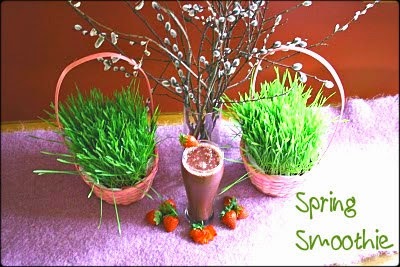 Hope you feel inspired to try this odd sounding delight... it is a delicious way to invite in the green this spring! Five days into Spring...I can hardly believe it! Spring evokes so many emotions for me, and also just plain things to do. There are seeds to plant, a henhouse to clean, a house to freshen, declutter and organize and busy children to keep me busy when I have a moment to spare. Grind well with mortal and pestle. Store in a glass jar with a label. I've been burning it for the past few days, and everyone who comes in has commented on how lovely my house smells. It's really helped to get me into the spirit of a Spring cleanse! Welcome to Twig and Toadstool! We want to be that friend of yours, who you can visit, and we hope when you leave you will feel lighter and brighter and full of good ideas. We also plan on inviting in our own friends and family members who inspire us personally, to share their stories and bright light with you all. My name is Maureen...I'm mother to 2 delightful little girls, Ruby aged 6 and Matilda aged 1, (Ruby would like to mention here that our cat Marshmellow is also a member of our family)! We live in a small village in Eastern Ontario, (by small I'm talking a couple hundred folks at best)! We are a first generation homeschooling family, (occasional unschoolers), who enjoy the best of what is out there...we're a little bit waldorf, and a little bit rock and roll!! We own a 1/2 acre of land, and we try to get alot out of it, we have chickens year round, lambs in the summer and huge vegetable gardens, (we're working on the fruit)! My passions are in crafts, sewing, photography, and now that I've finally learnt how, knitting!! We're also big supporters of the local food movement. You will spot us at the farmers market every week!! 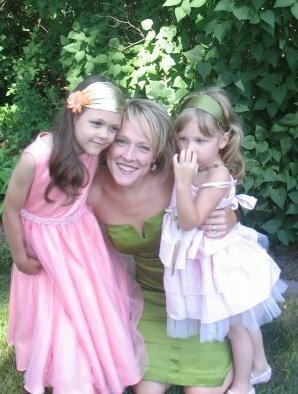 Well to follow in suit ~ my name is Shanti...I am incredibly blessed to be mother to Luna Rose (7) and Solana Fae (5). They are the light of my life and continually teach me, challenge me and share with me the wonder and magic in life! I am married to my childhood sweetheart and spend most of my days in the wee town of Killaloe, Ontario soaking up the deliciousness of life. I am a lover of natures unending bounty, creating beauty out of what surrounds me, nourishing my loved ones and those around me with beautiful food and continually searching out ways to inspire and be inspired. We are a homeschooling family, learning as we go. I love to be witness to the fruits of this choice in my girls and in the unfolding, beautiful friendship they share. Maureen is my fabulous friend that ignited this blog and encourage me to join on and share what I have to offer ~ She shines bright with enthusiasm, creativity and steadfastness. She continually inspires me and occasionally gives me a kick in the pants when I need it ; ). Welcome to our little corner of the bloggy world!! We'd be honoured if you'd stay awhile and share with us your comments, stories and enthusiasm! Come follow us on our journey!